We’d love your help. Let us know what’s wrong with this preview of Crimson Sin by Trina M. Lee. An angel girl with a destiny. The feisty Crimson Sin guitarist with commitment issues, a werewolf best friend and a penchant for partying. She's a nephilim, half human and half angel. Like all undecided nephilim, she has to choose: serve the light or the dark. The intriguing bass player who catches Spike's eye even though he's her competition in the annual Battle An angel girl with a destiny. The intriguing bass player who catches Spike's eye even though he's her competition in the annual Battle of the Bands contest. He's also an undecided nephilim and he doesn't even know it. An arrogant, drug dealing frontman. A dark nephilim, it’s his job to recruit Rowen for the dark and Spike is getting in his way. But there's something he doesn't know about Rowen. Something the dark has been keeping from Arrow. When Spike and Arrow go head to head in more than just music, blackmail and secrets exposed challenge Spike to accept what she most fears: that she belongs in the battle between light and dark. To ask other readers questions about Crimson Sin, please sign up. I found the character's speech/slang (Ex: rock n' roll'ish) overly juvenile & the detailed descriptions (ex: clothing) tiresome. This feels like YA & fans of YA may enjoy this series. If YA isn't your prefered genre but want a light-ish fun read, I'd recommend this author's Alexa O'Brien, Huntress series. I like Trina M. Lee. Although her books are a bit young adult for me, and not at all erotica as I've seen it classified by people, I enjoy every page of it. Her world-building and strong characters keep me turning the pages. I grinned like an idiot when Falon from the Alexa O'Brien series appeared, and I appreciated the amount of new characters in this spin-off. Yes I will read the author again! Yes I will read the next book! As I have gobbled up and loved every book Trina Lee has released, this one is no exception! 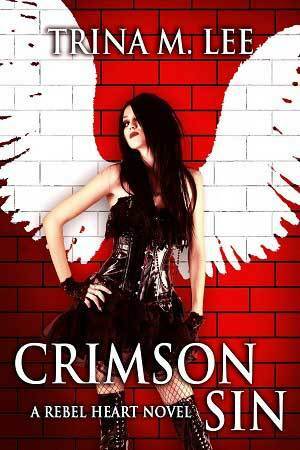 In this series, we get to follow the all girl rock band Crimson Sin from the Alexa O’Brien series. Their guitarist, Ember Evans, nicknamed Spike, is a nephilim, born to an angel father and a human mother. All nephilim have to choose between light and dark and until that choice is made, both sides try to sway them to their side. When a nephilim is undecided, as commitment phobe Spike is, it can Loved it!!! As I have gobbled up and loved every book Trina Lee has released, this one is no exception! In this series, we get to follow the all girl rock band Crimson Sin from the Alexa O’Brien series. Their guitarist, Ember Evans, nicknamed Spike, is a nephilim, born to an angel father and a human mother. All nephilim have to choose between light and dark and until that choice is made, both sides try to sway them to their side. When a nephilim is undecided, as commitment phobe Spike is, it can be very dangerous. They do not have access to their full powers and they may need them when they are fighting for survival. Can’t wait to continue to read more from Spike and Rowen’s story. Will they have what it takes to make it last, while cutting a record deal, going on tour, and fighting off demons and agents for the dark? It's my first book from this author and I really enjoyed this first book to this series. Spike was an undecided nephilim, who must choose whether she wants to serve the dark or light side but struggles with her decision. I also liked Spikes band crew, Jett, who's a werewolf and has a spit fire attitude and her human friends too but really like Cinder, an angel that watches and tries to help Spike with protecting herself without pushing her to make a decision while Koda the dark angel, tries to p It's my first book from this author and I really enjoyed this first book to this series. Spike was an undecided nephilim, who must choose whether she wants to serve the dark or light side but struggles with her decision. I also liked Spikes band crew, Jett, who's a werewolf and has a spit fire attitude and her human friends too but really like Cinder, an angel that watches and tries to help Spike with protecting herself without pushing her to make a decision while Koda the dark angel, tries to push her to join the dark side. Rowan who's in a rival band is also a nephilim but doesn't know it and when Spike meets him things started to get very interesting. I have not previously read any books by Trina Lee. Several reviewers have mentioned that some of the characters in this book were in prior books by Lee. While there were some mentions of prior events which I am guessing occurred in prior books, I had no difficulty in following the characters or the story without having read any of the other books. This is a stand alone book and a complete story [no cliffhangers] but it does all I received a free copy of this book in exchange for an honest review. I have not previously read any books by Trina Lee. Several reviewers have mentioned that some of the characters in this book were in prior books by Lee. While there were some mentions of prior events which I am guessing occurred in prior books, I had no difficulty in following the characters or the story without having read any of the other books. This is a stand alone book and a complete story [no cliffhangers] but it does allow for further adventures with the main characters. The story centers on Ember - better known as Spike -- who is a nephilim and has not chosen between light and dark. She plays guitar in a band and is involved in a band competition. A rival in the band competition, Rowen, catches her eye and he's a nephilim as well. The dark side is after Rowen and Spike wants to protect him. I enjoyed this story of angels and demons with a little romance thrown in. There is swearing, alcohol use, drug use, smoking and some sexual situations. All of this helps set the tone of the world where Rowen and Spike exist. There are bars which oriented for vampires and demons. This urban fantasy was a lot of fun and kept my interest throughout although I was a bit annoyed at Spike's indecisiveness -- as it seemed apparent how she should proceed. I especially liked Spike's mentor/guardian angel Cinder. My review was based on the audiobook. I really enjoyed my first glimpse at Spike’s world. I’m a huge Halestorm fan, so I was excited to read a fantasy story about a female rock band!! I was also happy that this book is a complete story with a satisfying ending, despite being Book 1 in a series. I ended the story satisfied, but intrigued about the next adventure. So great ! All of of these. Oops from this aut are really good. This is a very good book. Full of action, friendships, mystery, demons and angels. Strong story line and great characters. So grab your copy and enjoy reading. This is set in the Alexa O'Brien world but cash be read independent of the series. The book is fast passed, well written, and full of drama. J could not put it down. Really well written. The characters and storyline strong and well liked. Had already met some of them through the Alexander O'Brien series, which was cool. The concept was interesting. Niphillum must make a chose between dark or light, The story took a little too long to get to the juicy parts. Overall a good story. I'm a huge fan of the Alexa series,So I was looking forward to reading this one. Trina's books always manage to pull me into the story.I could imagine myself in the crowd watching the battle of the bands.Packed full of Great characters,I think I'd feel quite at home amongst the Werewolves, Vampires and Nephilim. The attraction between the two rival band members,Spike and Rowen is adorable and there's some brilliant twists with Arrow,I hadn't expected. I've got a real soft spot for Cinder,hope there's more to come from his character. I can't wait to see where this series leads. I am not going to rate this one, due to at this stage it is a dnf. I just couldn't get into the band scene this story follows, I really did try. In saying this, the writing is up to the normal standard of Trina M. Lee. If you are a fan of her work, do give it a go. As I say more about my personal tastes for this one. I hope to go back to it later and maybe enjoy it second time around. Love this book. Definitely a good take on angels, demons, and their offspring. I also love that Ms. Lee set this book into a world we are very familiar with and get to see characters cross over both series. I'd definitely recommend this series to anyone that loves urban fantasy and especially those who love books about angels, demons, and their offspring. I love the way the author wrote two different series but they are also intertwined. Good concept. The characters are gritty but fighting on the side of good. Very interesting. Loved it! I'm addicted to Trina' s books! loved it. not much like the alexa books but I enjoyed it. Love love loved it!!! I hate that I read it so quick. It is a must read but if you haven't read the Alexa O'Brien series then you will be missing out on who some mentioned characters are in book. Love this Author and book did not disappoint. New series. Loved it. If you like J.r ward's fallen Angel series this would be good to you. What a great story! It was a little slow and confusing at first but once you get used to the author's style of writing it grabs you thru the end! I am the author of the Alexa O’Brien Huntress and the Rebel Heart series. I write urban fantasy that is dark and gritty with a twist of romance and horror but which is ultimately about people in dark places discovering who they are and what they’re made of. I’ve been writing since the age of 9 when I had a Christmas themed short story published in the local town paper. A lover of rock music, vampir I am the author of the Alexa O’Brien Huntress and the Rebel Heart series. I write urban fantasy that is dark and gritty with a twist of romance and horror but which is ultimately about people in dark places discovering who they are and what they’re made of. I live in Alberta, Canada with my bass player husband, fierce teenage daughter and three annoying but super cute cats. I have a Venus Fly Trap that loves baby talk (she does, I swear) and a Dodge Charger named Delilah.